If you love summer cocktails then you probably enjoy a margarita now and then. But do you know how many calories are in a margarita? The margarita is one of the most popular festive drinks to serve with spicy food or to enjoy on a hot day. Now that skinny margaritas have hit the scene, dieters enjoy this cool drink as well. But if you're trying to lose weight, there are a few things you need to know about margarita calories before you dive into this drink. The number of calories in a margarita will depend almost entirely on how it’s made and where you drink it. There are roughly 156 calories in a strawberry-flavored TGI Fridays margarita. Many restaurant-made margaritas will have calorie counts in that same range. The other important fact to take into consideration is the size of your margarita. When you drink the cocktail in a restaurant, chances are good that you'll be served a larger-than-average beverage. As a result, the margarita calories will increase as well. Many frozen margaritas that are served at fast casual restaurants come in glasses that hold six, eight, or even 10 ounces of fluid. So if the drink is filled to the salt-rimmed brim, you may be consuming the equivalent of two or more cocktails. If you make your drink at home, your margarita calories will depend on the ingredients. Many home bartenders use mixers because they make cocktails more simple to prepare. But many of the most popular mixers are full of sugar and calories. Frozen margarita mixers can be especially dangerous for dieters because they are so full of processed sugar and calories that provide no nutritional value. A single 2-ounce serving of Old Orchard or Bacardi brand margarita mixer has 90 calories. Two ounces is about one-quarter cup. Most drinkers will consume a drink that is larger than that. And your margarita calorie count still doesn't include the alcohol. A single serving of tequila provides 65-70 calories. So your homemade margarita will probably total at least 150 calories, but possibly more if you prefer a stiff drink. 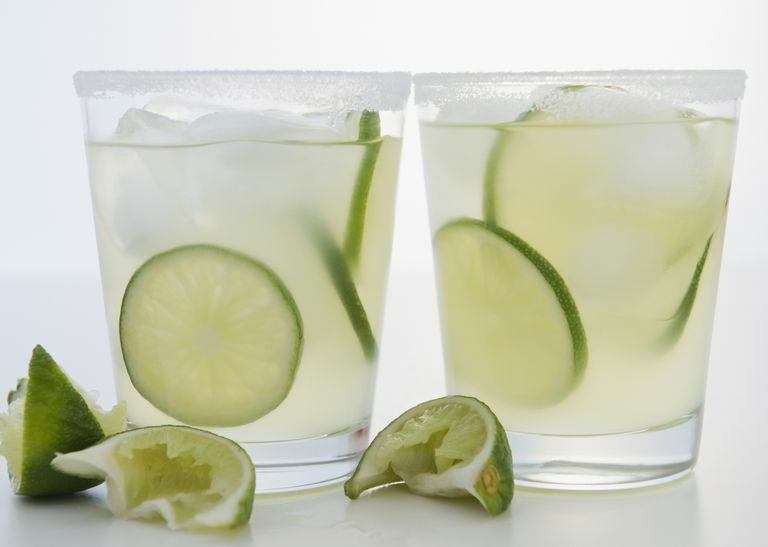 If you make your own margarita from scratch, you may be able to cut calories by using fresh, low-calorie ingredients. A classic margarita recipe is usually prepared with triple sec, tequila, sour mix, and a splash of lemon or lime. It will probably provide between 100-150 calories depending on how you balance the ingredients. If you want to limit the number of calories in your margarita, you might opt for a skinny margarita. Most skinny margarita recipes include fewer ingredients and provide fewer calories - but not much. Some dieters combine tequila, fresh lime, sugar (or agave nectar) and sparkling water to make a skinny drink. You may be able to save 25-50 calories with this recipe. Be careful if you choose popular “skinny” brands of cocktails to lose weight. The lower calorie count may be confusing. Bethenny Frankel’s Skinnygirl Margaritas contain only 35 calories per serving, but a serving is only 1.5 ounces. That's about the size of a shot glass. If you are craving a margarita, make your own. You can use HG's Magical Low-Calorie Margarita Recipe that uses diet lemon-lime soda and sugar-free lemonade powdered drink mix. The drink provides 115 calories for an 8-ounce serving. You might also want to check out skinny margarita recipes online. Take a traditional recipe like the Classic Skinny Margarita Recipe at The Cookie Rookie and tailor it to your own taste. You can decrease the amount of alcohol or add more ice to save calories. Or add a bit of sparkling water to make your drink bubbly, lower in calories and lower in alcohol. Or try a fruity Showstopper, made with low-calorie SkinnyGirl vodka. Adjust the ingredients to decrease calories and increase flavor. Lastly, remember that if you drink just one, then you can enjoy a skinny margarita and stick to your diet. But if you drink more than a tiny single serving, then the calories in your cocktail will probably be no more "skinny" than the calories in a glass of wine or beer. Should I Quit Drinking to Lose Weight? What Is the Taco Cleanse? Can You Drink Alcoholic Beverages on the South Beach Diet? What Are Empty Calories and How Many Should You Eat? Do You Have Healthy Menu Choices at Fogo de Chao?